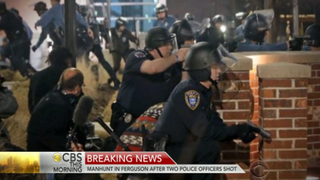 Police officers in Ferguson, Mo., crouch behind brick pillars after shots ring out early morning March 12, 2015, during a protest in front of police headquarters. Two police officers in Ferguson, Mo., were shot outside police headquarters early Thursday morning after protesters gathered there following news that embattled Police Chief Thomas Jackson would be resigning. “I don't know who did the shooting, to be honest with you,” Belmar said, according to AP. According to the St. Louis Post-Dispatch, at least three shots were fired. There was no description of the suspect, but Belmar added that based on the trajectory of the gunshots, he believed that the officers were standing and that "these shots were directed exactly at my officers." Beginning Wednesday evening, around 60-70 protesters gathered at the police station. Some protesters blocked roads and sidewalks, leading police officials to dispatch officers, some of whom were in riot gear, according to the Post-Dispatch. The Post-Dispatch reports that the scene turned chaotic once the shots were fired, with some protesters lying on the ground while others ran for cover. According to the Post-Dispatch, prior to the shooting, the protesters were not in alignment. One group was there to express the belief that the recent resignations of Jackson as well as City Manager John Shaw, amid the release of a Justice Department report alleging bias in the Ferguson Police Department, were not enough, the newspaper reported. This while another group of protesters was angry and hurling profanities at the police and media. Read more at Yahoo News and the St. Louis Post-Dispatch.